Download "Optimize. Respond to customers faster and easier, no matter how they contact you. Multimedia Contact Center. bring customers closer"
4 Zeacom Multimedia Contact Center benefits 1. Increased agent productivity Not only are agents able to answer more calls in less time, they have the information and functionality they need to help retain existing customers, source new customers and increase sales revenues. 2. More engaged agents By increasing the variety of work and matching it to your agents abilities, a Zeacom Multimedia Contact Center solution makes their job more enjoyable. It also makes your agents more efficient. Agents that have the tools to achieve their targets suffer less stress, reducing attrition and absenteeism. 3. Better resource management Intelligent routing of contacts lets you optimize the agents you have. Comprehensive reporting makes it easier to predict when you ll need more agents or if you can send the overflow to staff in other departments during peak times. You can also get more out of your existing agents by using automation to reduce handling time or offload routine inquiries. Queuing Handle s with the same care as phone calls. 4. Right person first time With a Zeacom Multimedia Contact Center solution, you can dramatically increase first call resolution. Calls can be automatically routed to the last called agent, to the most skilled agent or to another department for handling. 5. Customers spend less time waiting In efficient contact centers, agents spend less time on each call and can quickly move onto the next customer. During peak times, customers can be given the option of leaving a callback request or you can engage them with recorded music, news and messages. Offering customized announcements encourages callers to wait up to 35% longer. 6. Information to succeed A Zeacom Multimedia Contact Center solution encourages self-monitoring and healthy competitiveness between agents by providing them with easy access to real-time queue, agent and team statistics. Managers can use a combination of real-time and historical data to monitor performance, so that issues can be quickly identified and addressed before they impact on customer satisfaction. 7. Unify all your communication channels Your agents can receive and respond to every contact using a single interface, regardless of media type. Faxes, s, SMS messages, chats, social media and requests generated from the web are treated with the same care as phone calls, allowing your contact center to deliver a consistently high level of service. Social Media Queuing Listen in on social media conversations. Deliver outstanding customer service regardless of media type. 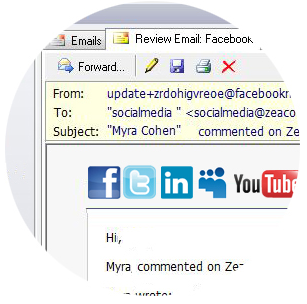 With Zeacom Multimedia Contact Center, every communication is handled quickly and professionally. WAYS. Your Contact Center. to Boost Productivity. Tips for making your call center agents more efficient and your customers happier. Benefits of using. Why was our power dialer created?